CAMAGUEY, CUBA, Feb 3 – The villa of Santa Maria del Puerto del Principe awoke on Monday to Liberation War-era reveilles and serenades in different places, parks and plazas of this city, a Cultural Heritage of Humanity, as it turned 501 years. 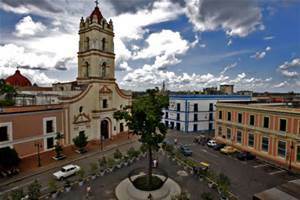 The people of Camagüey, considered by Cuban researcher Luis Alvarez to be one of the oldest existing cities in America — older than New York, Mexico City, Rio de Janeiro, Buenos Aires and Lima — were immersed since Sunday in the Week of Culture of Camagüey, held to celebrate the anniversary. The Love Park, in Republic Street, one of the major commercial arteries of the former village, founded on Feb 2, 1514, joined in the activities which adorn the region further. The local authorities assured that the works of renovation and conservation would continue in the coming years. As a result of the instability of the settlement of the villa, few examples of the architecture of the era, up to the last third of the 17th century, are preserved. The current centre of Camagüey, covering 54 hectares, is an exceptional example of traditional urban installations, relatively isolated from the main streets. The site reflects the predominance of numerous styles, appearing in different stages of its development: neo-classical, eclectic, neo-colonial.